JACKSON HOLE IS recognized around the country as a premier vacation destination, but not so much as a premier place to do business. Some seasons it seems restaurants and shops come and go with the rapidity of a fresh hatch on the Snake River. Wannabe workers sometimes can’t find (or afford) housing. Employers complain that workers disappear on powder days. But, for the right companies, there’s no place other than Jackson that they could have gotten their start. DMOS: “‘Do My Own S___’—we never finalized it,” says Harvard Business School alumna and former financial consultant Susan Pieper. In 2015, Pieper founded DMOS Collective, which makes lightweight shovels (some with serrated teeth for breaking up ice and compacted snow) with collapsible handles out of aircraft-grade aluminum alloy. Stuff? Shoveling? S&!% ? Pieper is the first to say that DMOS would not exist had she not moved to Jackson in 2012 with her son and now-ex-husband. She got the idea for a heavy duty, lightweight shovel while watching her snowboarding son, Steven Bailey, break shovel after shovel as he and friends built snow ramps and jumps in her East Jackson backyard. “I saw that lawn and garden tools were generic and dumbed down,” she says. the International Freeskiing and Snowboarding Association men’s 15-18 big mountain snowboarding league. 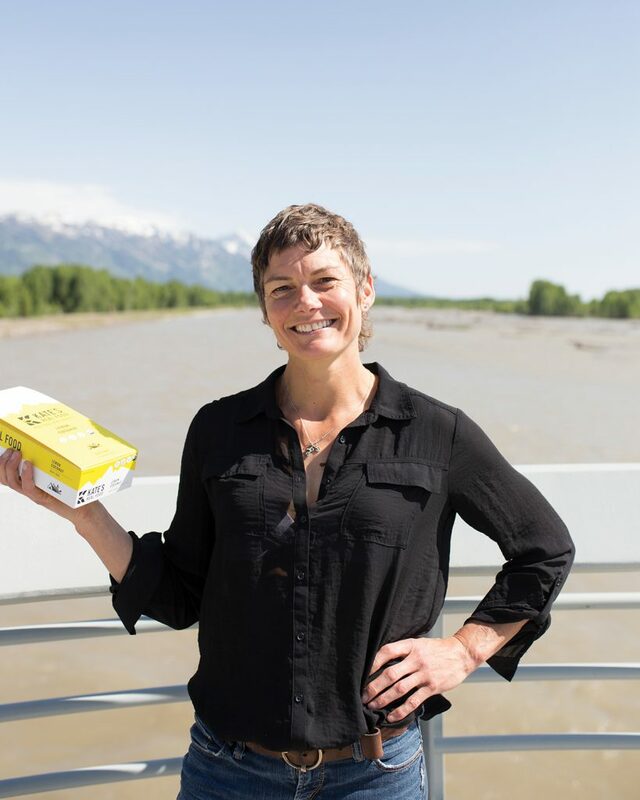 In the early 2000s, if you were a diner at Nora’s Fish Creek Inn at the base of Teton Pass and got Kate Schade as your waitress, you might get a hand-rolled energy bar left with your bill. Schade, who moved to the valley in 1993 to ski as much as possible, worked part-time at Nora’s. In her own kitchen, she concocted calorie-rich energy bars to get her through long ski days. Schade called her bars, which included oats, honey, peanut butter, milk chocolate, brown rice crisps, dried apricots, raisins, sunflower seeds, sesame seeds, and sea salt, Tram Bars, because, well, she most often found herself eating them in the Jackson Hole Mountain Resort (JHMR) Aerial Tram line. In 2007, after more than a decade of passing Tram Bars out to friends, Schade graduated to selling them in local stores like Teton Mountaineering and Jackson Whole Grocer. In 2010, with the idea of growing the company even more, she took on an investment partner and Tram Bars LLC was formed. At that time, you could find Tram Bars (and newer flavors like the Grizzly Bar) in stores in about twenty states; annual sales were about $100,000. By 2014, Kate’s bars were available in about thirty states, and annual sales had grown to about $700,000. Stio launched its first product line in 2012. Founded by outdoor apparel veteran Stephen “Sulli” Sullivan, Stio’s goal from that very first collection was to capture the essence of Jackson Hole’s lifestyle in every piece of its clothing. “From top to bottom, concept to finished product, the entire company is fueled by a desire to remain authentic to the Jackson Hole lifestyle—an existence epitomized by adventure, conservation, and, of course, fun,” says Sulli, who prior to founding Stio founded the outdoor clothing company Cloudveil with Brian Cousins. Shuptrine, who previously worked at Cloudveil and has been with Stio since 2012, says Stio infuses the Jackson Hole environment in “everything we do.” Influences from the Jackson Hole landscape and environment might inspire a particular print, or the clear blues seen in the sky here might be the perfect shade for a T-shirt. “The brand is all about Jackson Hole and our lifestyle here,” Sulli says. Sherman founded Igneous on his own, and made his first pair of skis in 1994. Then he started making skis for friends and friends of friends, and Parris came on board. There was a brief period in the early 2000s when Igneous ramped production up to as many as 400 pairs a year, but Sherman and Parris quickly scaled back to around 100 pairs. “That keeps it manageable,” Parris says. “I like to get to know each client individually.” Ideally, Parris will take a run or two with every Igneous client, too. Parris likes skiing with Igneous clients because he’s not just making skis that can handle the unique demands of skiing in Jackson Hole, but that also meet specifications determined by the person skiing them. Leave it to three Jackson Hole attorneys to found Wyoming’s first legal distillery and then make the state’s first whiskey suitable for anything other than starting campfires. Wyoming Whiskey, which has its administrative offices in Jackson, a production facility in Kirby, Wyoming, and gets its non-GMO grain from Byron, Wyoming, was incorporated in 2006 and released its first batch of whiskey in December 2012. This past summer, the company entered into a “strategic partnership” with Edrington, an international premium spirits company that owns Macallan, Highland Park, Glenrothes, Cutty Sark, and The Famous Grouse. On its own, Wyoming Whiskey grew its distribution to thirty-two states. The new partnership with Edrington will result in distribution of the brand in all fifty states, with international distribution on the horizon. Todd and Steve Jones, two of the four founders of Teton Gravity Research (TGR), could have been happy starring in Warren Miller Entertainment (WME) films, which they were first asked to do in 1994. Except, when the brothers tried to take the WME film crew to their favorite spots, they protested. “We were excited to show them the Jackson Hole playground, and we tried dragging them all around the backcountry,” Steve Jones says. “But that’s not what they wanted.” The next year the Joneses, Dirk Collins, and Corey Gavitt pooled money they had earned working on commercial fishing boats in Alaska, bought camera equipment, and, despite none of them having any experience making movies, shot one. Today The Continuum is in the U.S. Ski & Snowboard Hall of Fame and Museum and TGR has released 38 other movies. Jones says he’s seen people wearing TGR’s branded lifestyle clothing—hats, T-shirts, sweatshirts—as far afield as the Maldives. The company employs between forty and fifty people in its offices at the base of Teton Pass; has a retail shop on the Town Square (and soon also at the Jackson Hole Airport); partners with JHMR for kid’s ski and snowboard camps; annually donates the proceeds from the Teton Village premiere of its latest movie to a local nonprofit; is in talks with several dozens of stores in China that want to carry their clothing; was named one of the 20 most influential companies in the outdoor industry by Outside magazine; and recently came out with a full-length feature on bipolar disorder and a short film about cancer.